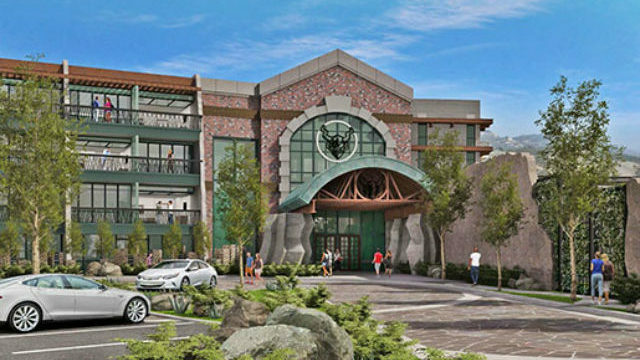 Stone Brewing Thursday announced a partnership with Untitled Hospitality to build and operate a brewery-themed hotel next to the Stone Brewing World Bistro & Gardens in Escondido. San Diego-based Untitled Hospitality will build, own and manage the hotel on a 13-acre property under a licensing agreement with the country’s 10th largest craft brewer. “After originally envisioning a hotel on the property more than six years ago, we had put the project on permanent hold due to our need to focus on our core obsession of brewing,” said Greg Koch, Stone Brewing’s CEO and co- founder. “When Robert (Cartwright) and Untitled Hospitality approached us with the idea of them taking the ball and running with it, we found a partner who was fully engaged in the idea of executing on the Stone ideals, ethos and creativity,” Koch said. The beer-centric facility — which is slated to open in early 2018 — will offer displays of beer flowing from a tap, Stone memorabilia and three bars. Stone said guests will receive a complimentary Stone beer immediately upon check-in, and in-room growler delivery service will be available.